In the summer of 2017, I turned away from my ultimate dream, becoming a Physician Assistant. After completing my undergraduate career with honors in three and a half years and taking two years to work in three healthcare related jobs, I was headed off to the next step of my dream: Physician Assistant school. I walked into school as an overzealous, confident student excited for the next adventure. And two weeks before finals of my summer semester, I decided to take a leave of absence. I felt extremely burned out and I did not feel as though I would be able to continue in the program any longer. Before I continue telling the many reasons for my burnout, I have to disclose a hidden part of my identity that led to all this. I am a DREAMER PA-S. Standing under dim auditorium lights during my second grade concert, I remember proudly belting out the patriotic lyrics “This land was made for you and me”. At a young age, I bought into the naive immigrant belief that this nation would support my hopes and dreams. Growing up, however, I learned about the insurmountable obstacles immigrants face when reaching for their goals. Nevertheless, those barriers shaped my experiences and helped me thrive academically and culturally. My undocumented, first-generation status hindered me from numerous opportunities. Additionally, I faced different forms of microaggressions which caused me to question my identity as a future medical provider. Overall, the obstacles I have faced have also guided me in the road to becoming a Physician Assistant. My mother arrived with me in her arms when I was a nineteen month old child from Bangladesh. My arrival into the United States was faced with hardships and through all the adversities I would have to strive more than my peers for accomplishments. During my second year of college, the miracles of miracles occurred during the Obama administration. I received the crucial social security number and work authorization card under the temporary executive law of Deferred Action for Childhood Arrivals in the summer of 2012. During that time, I knew I had to pursue my tenth grade dream of becoming a Physician Assistant because I had to help those who were like me, patients who were uninsured and undocumented like myself and my parents who deserve access to healthcare. I had witnessed my mother with her swollen ankles and feet with a family history of heart failure and ovarian cancer not be able to think about going to a primary care office for preventative screening or any medications. There was one night, my father woke with extreme chest pain and we immediately had to take him to the Emergency Room. After conducting an EKG and waiting for the troponin level, the Physician Assistant at the time had found that my father may have mild case of pericarditis which may have been caused by a viral infection he had weeks ago. However, his blood glucose tests indicated that he had a definite case of untreated Diabetes Mellitus. And when we had had expressed that he did not have a primary care provider due to the immigration status, she immediately ran to her desk and filled out a prescription for a three-month supply of Metformin. I wanted to be like her from that day on. And even though it was only for three months, it had meant a lot to my father and me. At the time, we did not know how else to seek treatment for such a chronic disease. From that moment on, I wanted to be the Physician Assistant who understood the hardships that immigrants like ourselves face on a daily basis would do anything in her power to help those in need. Attending graduate school in January 2017 had a tremendous effect on me and provoked more anxiety within me. My first semester, when my professors would speak about one day seeing my patients, I would immediately run to my room and cry. It had dissipated my vision of one day working as a PA. I could no longer envision myself wearing a white coat, stethoscope around my shoulders, approaching patients. During the time, I truly felt unsupported as though all the odds were against me. As an undocumented student, I was constantly afraid of sharing my status which had made me feel isolated from all my classmates and exacerbated by loneliness and anxiety. This became one of the reasons I suffered even though I was exactly in the midst of my dreams. As a PA student, I became to feel isolated as I acknowledged the privileges of my peers knowing that one day they would be able to practice medicine in the US. In the fear, I was not able to disclose my concerns to any of my advisors, professors, and peers. I was running a marathon with everyone in my class while carrying a heavy armor on my shoulders and it was truly draining me. I never thought I could share with any of the students what I was dealing with and I felt completely alone and vulnerable. Students arrived from all over the nation however majority of the students were entitled with families from higher socioeconomic status and I had to acknowledge that they may not be able to empathise with me. And I lost hope in myself as I started comparing myself to others as I began realizing that I had additional stressors in comparison. And I didn’t know how to voice it to anyone. I lost my vision that I could not ever be a healthcare provider due to my status. So I had a hard time concentrating in the beginning of the semester. And I did very poorly on my first three exams but then I boosted myself and started doing well in my classes. During finals however I began to feel alone and anxious which caused me to do poorly on my finals. I ended my first semester with a 2.71 and I was placed on academic probation. In the summer semester I was really hard on myself and that aggravated my anxiety and stress. Exam grade scores began to define my self-worth and ambition which lead me to lose my motivation and focus. I began to forget why I wanted to pursue this profession in the first place. But most importantly I began to forget my identity and that’s when I knew I had to take a break and reevaluate myself and my career choice. So I began writing and traveling to help me figure it all out. At this point, I do not know what the future holds for me any longer since the temporary DACA act was rescinded in September 5, 2017 but I do know that I cannot stray away from my path because my diverse experiences and identity help define my role as a future healthcare provider. During my time away from academia, I started working in a community hospital with a plethora of immigrants and refugee patients and the providers deliver compassionate care. The patients and providers have inspired me to continue pursuing my dream. Everyday is a new perspective for me. I have taken the time to reflect on how I had gotten to such a point of despair and hope to change my outlook on the outcomes in the future. After reflecting back on this experience, I have decided that perhaps if we can change the way we look at ourselves and the events occurring around us, we can be the change we want in ourselves. Sometimes we have to take what happens to us in life and learn to see it in a more positive perspective. In the beginning, I had perceived this as a setback but perhaps it’s more of a blessing in disguise. My self worth as a person, student, immigrant, and future provider is only set by myself. 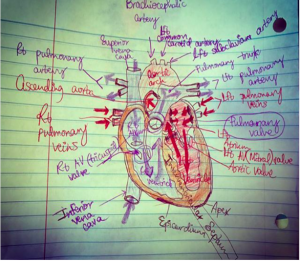 In my heart of hearts, becoming a Physician Assistant is the dream that I had fallen in love with. And even though, it feels like it’s a step backwards, it truly is not. In January 2018, I decided to return to MCPHS PA program with a more positive vision that my childhood dream of practicing as a Physician Assistant will be accomplished. My name is Rezwana Hoque, PA-S. I grew up in Hudson, NY and graduated from Clark University in Worcester, MA. My parents were born and raised in Dhaka, Bangladesh and they arrived to America at young ages in hope to better their lives as well as the lives for my two brothers and I. Currently I am attending MCPHS University Physician Assistant program on the Worcester campus. I aspire to work with the underserved populations and I currently enjoy working in a Family Practice setting.